Welcome back to Go Forth And Game. This time I’m interviewing Chris and Suzanne Zinsli, the folks from Cardboard Edison. We talk about Tessen, Van Ryder Games, and what’s going on at the CE HQ. Tom: What do you want to tell us about yourselves? Suzanne: We are Chris and Suzanne Zinsli, though people online may know us as Cardboard Edison. 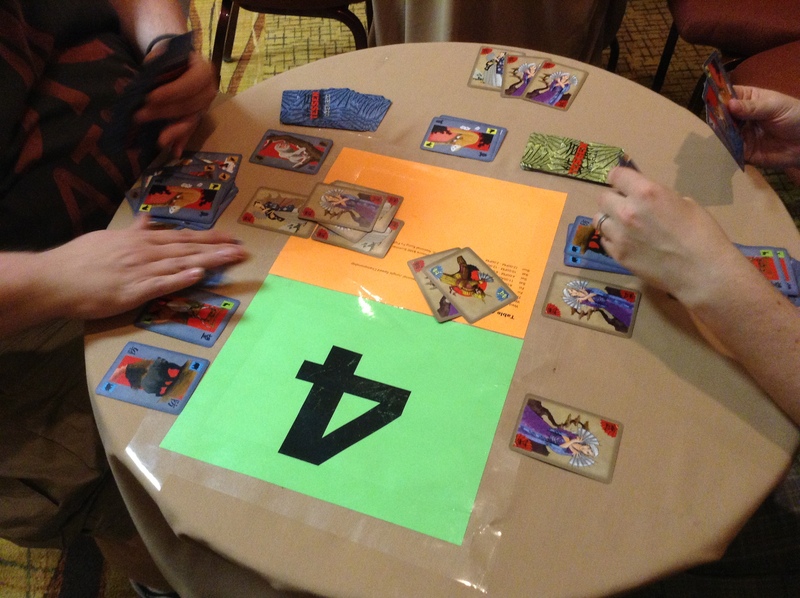 Chris: We design games under that name and run a tips blog for board and card game designers. Our first published design, Tessen, will be coming out soon. Suzanne: And we live in New Jersey with our wonderful four-year-old daughter Lily, who is a budding gamer and designer herself. Tom: I’m alway interested to hear what other gamers do for a living? How do you support your gaming habit? Suzanne: I am a stay-at-home Mom and love every second of it! Chris: I’m a business journalist and an editor for an online publication covering the venture capital industry. Tom: What was the gateway drug? What game got all this started? Chris: To our friends and family, we’ve always been gamers. We were the couple playing Travel Scrabble and Tri-Ominoes at the laundromat and the coffeehouse around the corner. But we didn’t really discover modern strategy games until we came up with an idea for our own game, a word game called Skewphemisms. (Yes, we got into games through game design!) The first modern board game we fell in love with was Carcassonne. Suzanne: It’s funny because Chris went to a local game shop for a game night, played it and bought a copy for us. He was not sure if I would like it, but after playing it once, I wanted to play it all the time. I became addicted, still a little addicted to it. Every time I play, I think of things I could have done differently and how drastically that would have changed the end game, which makes me immediately want to play it again. Tom: You have several designs in the works. Talk a bit about them? 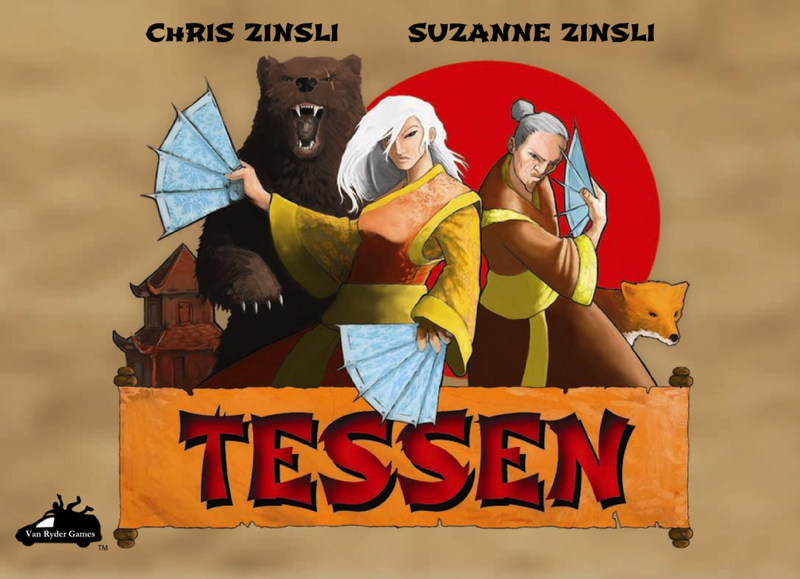 Chris: Our first game, Tessen, is about to be published by Van Ryder Games. 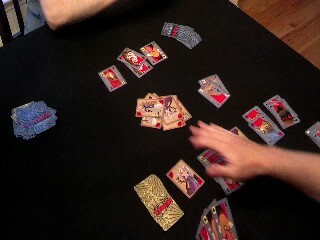 It’s a real-time card game for two players based in feudal Japan. We’re also developing a word party game called Skewphemisms. That’s a big group game based on alliteration. And we’ve started working on our next big project. Suzanne: We also have many other game ideas that we’re trying to find the time to develop. Tom: Tell us more about Tessen. Chris: In the world of Tessen, the Shogun has grown tired of the constant bloodshed between the clans, so he has declared that all disputes will be settled by a “Tessen challenge.” The Tessen is the war fan that samurai use for attack and defense, and it’s the only weapon the Shogun would allow. The clans must gather eight mystical animals, with the clan that saves the most animals being declared the victor. Chris: Tessen will feel familiar to anyone who grew up playing games like Speed/Spit or Dutch Blitz. We wanted to make a game that captured the feel of those games but that offered more strategic decision-making. It’s a game that can be enjoyed by very casual gamers but still offers interesting decisions for gamerly gamers. Suzanne: A.J. Porfirio of Van Ryder Games is going to run a Kickstarter campaign for Tessen starting on Monday, July 29. Backers can get the game for just $12! 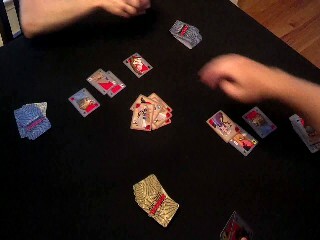 Chris: I love games that let you try to read the minds of the other players. If I can plan my moves in part based on what I think everyone else is going to do, that’s the sweet spot for me. Now that I think about it, that might be what connects some very different games that I love. Coloretto and The Resistance are on opposite ends of the gaming spectrum in many ways, but in both cases, a good player is rewarded for getting inside the heads of the other players. Suzanne: One design element that really interests me is variable setup and modular boards, like Forbidden Island, Survive: Escape From Atlantis! and Salmon Run. Tom: I played Forbidden Desert last night. You would probably like it. What inspires you? Suzanne: Playing really good games, and especially playing works in progress by other designers. Chris: I’ve found that nothing inspires new ideas like old ideas. Flipping through old design notebooks never fails to stir up some new ideas. I also like learning about unfamiliar subjects in bite-sized chunks. The site Mental Floss is great for that. Suzanne: Chris and I are both very creative people. When we met in college twelve years ago we were both in the arts. I was studying creative writing and he was in media arts. Board games are a passion we both share, so the idea to create them together just grew organically. We are very different players and usually have totally opposite strategies, so in game design it really works because we get the chance to view it from different angles. Tom: You’re pretty active on Twitter and in the design community. How helpful is that to you? Is the community important to you? Chris: Wow, we can’t underestimate how important the design community has been to us. There are so many people out there who are willing to help by discussing game design or by playtesting. One reason we created the Cardboard Edison tips blog was to give back to other designers. Suzanne: The community is just so open and friendly and welcoming. It’s made up of some really special people. Tom: Your blog is a fantastic idea. As a fellow designer I really appreciate you do that. Theme or Mechanic. Which comes first for you? Suzanne: Theme, I love getting totally immersed in the world of a game. Chris: Theme seems to be the starting point for me most of the time, and my mind very quickly moves to figuring out matching mechanics. But even more importantly, I try to consider the player experience that will arise from the combination of theme and mechanics. Tom: Ok, let’s talk about Unpub3. What games did you take? Suzanne: We took two games: Skewphemisms and Tessen. Actually, I had to convince Chris to take Tessen. He was not sure if it was ready or not. We look up to a lot of the Unpub designers, so it was a little scary knowing they would playtest our games. I felt Tessen was ready and I told him that if it wasn’t, then this was the place we would find that out and then hopefully get some good feedback on how to fix it. Chris: Luckily, I listened to her! Tom: Was it helpful? Did you get a lot of good feedback? Suzanne: Oh my goodness, YES! It was great and the feedback was wonderful and very helpful! Tom: Any major changes because of it? Chris: One player suggested a new way to use the warrior cards that was so obvious and elegant that we made the change on the spot. We also shortened the number of rounds to keep the game moving along. Unpub turned out to be a MAJOR milestone for us. That’s where we met A.J. Porfirio from Van Ryder Games, and where he decided to pick up Tessen. Chris: A good player can play to win but still have fun if they lose. It can be a tough line to walk. No one likes a sore loser, but at the same time, games often fall apart if players aren’t giving it their all. Suzanne: I think a good player is someone who is willing to teach new players a game and remains patient as the new player learns. I’ve played with people who have taken the time to show me the game, and with people who have gotten impatient, and it’s uncomfortable to be a new player in that situation. Suzanne: After one play, I think you can know whether or not you like a game, but to really review it, you need multiple plays. Ideally, you’d play a game with different people, because games can play so differently depending on who you play with. Chris: Games are designed to be played multiple times, for the most part. I used to review movies, and although repeat viewings would certainly lead to better movie reviews, they aren’t necessary the way repeat plays are required to really understand a game. Suzanne: We’ve played a few, including Love Letter and some prototypes from designers we know. I like microgames, but they aren’t my favorite. I prefer longer, heavier games where you’re really invested in a strategy that plays out over multiple rounds. Chris: I really respect a good microgame that’s simple and elegant and achieves a satisfying experience with very few components. I hope microgames aren’t a passing fad. The portability of microgames means they’re out in public more often, which could be a great thing for expanding the hobby. We’re developing a microgame of our own called White Rabbit. It’s a card game with just one card! Actually, that’s a slight stretch. There’s more than one card, but only one printed card. The rest are completely blank. Suzanne: Wow, there are actually a bunch! A few that come to mind are Captains of Industry by Michael R. Keller, Hostage Negotiator by our publisher A.J. Porfirio, and Knot Dice by Matthew O’Malley. Chris: We both also love Intrigue by Jay Treat. And there are a lot of other really cool designs in the works that we’ve been lucky enough to play. Too many to mention, so no disrespect to any that we left out! Tom: I REALLY like Hostage Negotiator. That one is going to be a hit. I’ve played Intrigue and enjoyed it also. What are you currently playing the most? Suzanne: The Cat in the Hat: What’s in the Cat’s Hat? Game with my four-year-old daughter, The Resistance: Avalon and Viticulture. Chris: A couple of modern classics: Ra and Tikal. And our daughter has been enjoying Spot It! lately too. Tom: I got to play Ra again last night. It is so elegant. What game surprised you and how? Suzanne: Mancala because it is so simple and yet very strategic. Chris: Oh man, Mancala kind of blew my mind with how much thinking you can do with such a simple concept. I’d also put Hanabi in that category. So good. Chris: We’ll be at Gen Con in a couple of weeks, and Van Ryder Games is running Tessen tournaments each day on the convention. We’ll be there to lend a hand, and because we’re excited to see a big group of people playing our game for the first time! We’ve also started working on a new design with the working title of Cottage Industry. It’s our most ambitious game yet. It’s a whimsical economics game set in a fairytale land that combines worker placement (or something close to it) with resource management, bluffing, bidding, map building and even some storytelling. Tom: Oh, that sounds very interesting. If you need playtesters, we have a great group here in Durham. What are you currently reading? Chris: I’ve been going back and forth reading chapters from two books on game design: Rules of Play by Katie Salen and Eric Zimmerman, and Game Design Workshop by Tracy Fullerton, Christopher Swain and Steven Hoffman. Suzanne: The Jesus I Never Knew by Philip Yancey. Tom: I’ve heard really good things about the Yancey book. I need to read that. What was the last good movie you saw? Chris: As parents of a young child, getting out to the movies is a pretty rare event for us! But we’ve been catching up on the series Once Upon a Time through Netflix in recent weeks. It’s sort of like research for Cottage Industry, but really that’s just what we tell ourselves to justify the time not spent designing! Suzanne: Lily and I did have a movie night while Chris was at Origins and we watched Monsters, Inc.
Tom: Monsters, Inc. is such a cool and original story. It’s a masterpiece. Chris: We’ve also been watching the new season of Big Brother on CBS. I know, I know. But in all honesty, it’s a great show for game designers to watch. Seeing how social dynamics play out in the house is fascinating. And the producers will constantly change the rules on the contestants, which is horribly unfair, but watching the players adapt to new circumstances can give designers great insight into player psychology. Suzanne: We love to meet new people to hang out with, play games, grab a drink, whatever. So if anyone is at a convention we’re at or if you’re in the New Jersey area, let us know! Suzanne: For information on Tessen, check out the Van Ryder Games website. Chris: I’m fascinated by conspiracy theories. I don’t personally subscribe to most of them, but I love seeing how people connect the dots between seemingly unrelated events, and the logic they use to do it. Suzanne: One of the best jobs that I ever had was managing a used bookstore in downtown Jersey City, N.J.
Chris: That bookstore was great. Suzanne: Tom, we would like to thank you for interviewing us and for putting together such a great blog! And we also want to thank A.J. from Van Ryder. He has just been amazing to work with! Chris: Absolutely. I think A.J. is spoiling us! He’s been such a pleasure to work with. He has really taken Tessen to the next level, and he has been so respectful of us as designers. And Tom, thanks again for inviting us here! Tom: You guys are awesome. Thanks for being my guests. Update: Z and I played Tessen at game night this week and really liked it. In fact he liked it so much he’s going to spend his own money for a copy. You can back Tessen for only $12 right here. Thanks for joining us on Go Forth and Game. How about leaving a comment below?